Entrance to the Kim Il-sung Exhibition Hall. Source: Commons/TF92. New excavation activity has been spotted at one of North Korea's largest museums. The International Friendship Exhibition is a massive underground complex in Myohyangsan, North Pyongan Province that houses vast stores of gifts and artifacts relating to the lives of Kim Il-sung, Kim Jong-il, and now Kim Jong-un. The exhibition is a major tourist destination and pilgrimage site for foreigners and North Korean citizens respectively. It was constructed in 1978 among Myohyang Mountain (Mysterious Fragrant Mountain) which is the alleged home of King Tangun - the legendary father of the Korean people. This location helps to solidify the Kim's regime claim to be the rightful rulers, not just of the north, but of all Koreans; similar to the implication of the claim that Kim Jong-un was born on Mt. Paektu, which is the spiritual birthplace of the Korean people. Surrounded by centuries old temples and religious hermitages, as well as the mystical significance of the area, this museum to the legitimacy and "global importance" of the atheistic and communist Kim family takes up as much as 70,000 square meters (753,000 square feet) of space - much of which has been cut deeply into a mountain side - and contains upwards of 220,000 gifts. Now that Kim Jong-un is the ruler, gifts to him (including such mundane things as an iPad and Lenovo desktop PC) need their own space within this complex, and satellite images now show increasing activity at the site. In the above image you can see the three main external buildings as well as the two areas of recent excavation activity. The horizontal distance between the two sites is approx. 530 meters (1,738 ft). Here is a close up of the upper site as seen on Oct. 8, 2016. Traces of old spoils/debris can be seen as well as the original underground entrance to the excavation areas within the mountain. 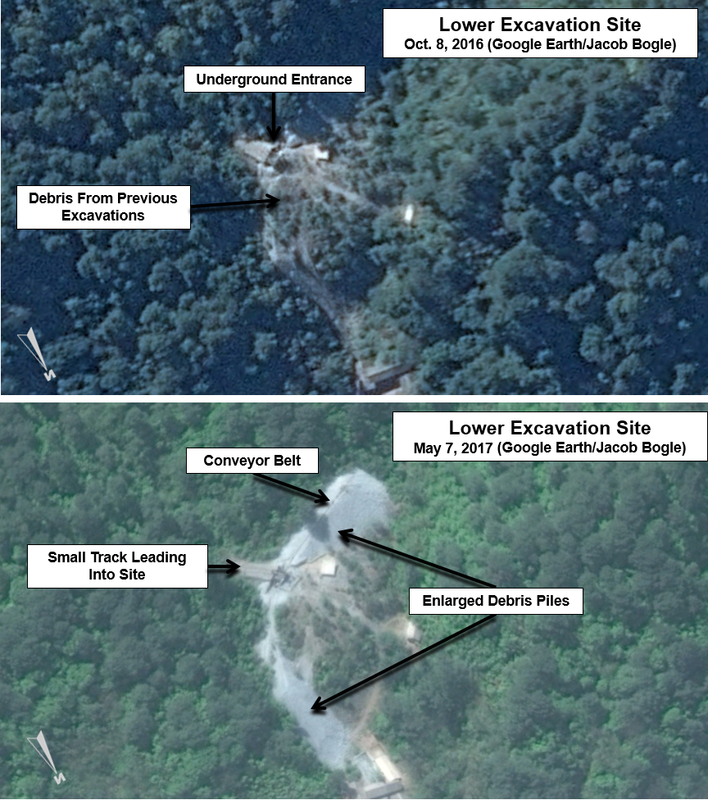 The trail of newly dumped material extends for some 110 m (360 feet) from the entrance as seen in this image dated May 7, 2017. In this larger view of the lower area of activity, you can also see an older dump site of previously excavated materials. The site's hardened electrical substation is also visible. Finally, this comparison close-up image of the lower site clearly shows the activity underway. As I wrote about in 2015, a new runway was constructed at the site to ensure ease of access. Additionally, the nearby and mysterious Hagap site has also had activity resume as of 2016.